On the evening of the Monday 30th June 2014, I arrived in Paris for the start of my research residency at Centre Pompidou. The event (part exploration of the archive, part conference) had been organised in response to the 25th anniversary of the exhibition ‘Magiciens de la Terre‘. I had been selected, along with 23 other scholars and academics, to present my work in relation to the relevant themes of the exhibition, and to produce a new piece of writing in response to the exhibition archives. As part of the 25th anniversary celebrations of ‘Magiciens de la Terre’, two of the fourth floor galleries in Centre Pompidou (the original venue for the 1989 exhibition) had been taken over by a documentary exhibition. This consisted of posters of artworks from the show, selected and arranged by the artist, Sarkis. Alongside this were vitrines of selected items from the archive, which included notes, drawings, maps and contextual information, as well as sound and video. All of this aimed not only at giving more context to the production and interpretation of the artworks, but also to the processes involved in creating an exhibition on a global scale. The conference took place every morning within the exhibition galleries of the dossier-exhibition of ‘Magiciens de la Terre’, and were presented as three main sections: the genealogy of the exhibition, its critical reception, and the theoretical displacements it generated. Conference papers were presented by each of the invited participants, and each discussion was chaired and ‘activated’ by a different international keynote speaker. During the afternoons, participants were invited to attend tours of of Parisian museums and institutions that had “contributed to the critical reflection and research around the historical construction of collections and global discourse”. In addition to this, participants took part in collective writing workshops, with the aim of producing a journal which would be distributed throughout the exhibition for its duration. 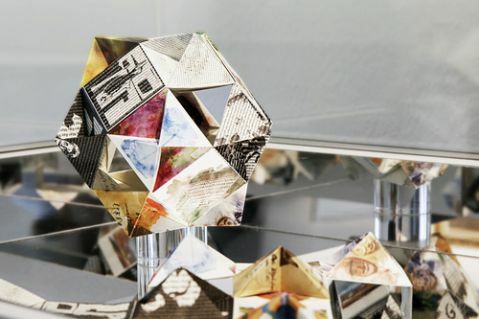 The journal was to be aimed at a wide cross-section of the exhibition-going public and was intended as an interpretation of our research inside and outside the archive, as well as of the ongoing discussions around the exhibition as a whole. The journal was designed and produced by the graphic designers of s-y-n-d-i-c-a-t (François Havegeer and Sascha Leopold) who also supported Sarkis in the exhibition design. On the first day we were introduced to the initiators of the project, Mica Gherghescu and Didier Schulmann, curators for the Musée national d’art moderne, Bibliothèque Kandinsky/ Centre Pompidou, Paris; Jean-Hubert Martin, the original curator from ‘Magiciens’; and Annie Cohen-Solal, curator of the Magiciens 2014 programme, who would remain with us for the duration of the 10 days. Alongside these were a range of speakers and contributors who would introduce us to the conference themes, gallery and museum tours and library archive. The first set of discussions focused on the premises, genesis and concept of Magiciens de la Terre and we were joined by contributors to the original exhibition, artists Sarkis and Miralda, photographer Bernard Lüthi and curator Mark Francis. Martin and Francis discussed the benefits of personal networks in finding artistic and curatorial collaborators. Throughout the first week we were also joined by CNRS researchers and anthropologists Benoît de l’Estoile and Carlo Severi; artists Sarkis and Miralda; and Université Paris 8 Professor, Laurent Jeanpierre. During this time, myself and the other invited participants also presented our research relating to the history of the Magiciens exhibition on topics as diverse as Aboriginal art, digital archives, the Brussels International Exhibition of 1897, the agency of artists and artworks, contemporary installation art, Latin American feather art, oral histories, art journalism, and the poetics of relation text. A series of visits were planned to galleries and museums in order to contextualise some of the histories of global exhibitions. Our first visit was to the Cité Nationale de l’Histoire de l’Immigration which was the venue of the original colonial exhibition. Such international exhibitions were originally conceived to show ‘the world in one place’ and to convey the ‘mutual benefits’ of colonisation to their 19th Century audience. The immigration museum had updated its displays to show how France had progressed beyond its colonial history, however it was generally felt that using the space for the new museum was problematic and it might have been better preserved as a historical archive of colonial practices, as with the Pitt Rivers Museum. Our next visit was to the Musée du Quai Branly, formerly Le Musée de l’Homme (or The Museum of Mankind). Although attempts were being made to address previous colonial collections and relationships, the collections were still predominantly comprised of objects from the previous museum of Anthropology. To deliver their mission of showcasing global cultural practice, the museum had invited aboriginal contemporary artists to contribute to the building by producing their paintings directly onto the museum architecture. They had also attempted to purchase more contemporary African photography to complement their collection of research and travel photography from fieldwork. The last visit of the week was to the rehung collection of Modern art at Centre Pompidou. 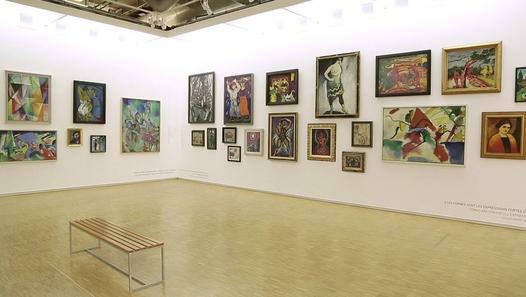 The exhibition, ‘Modernitiés Plurielles: 1905-1970‘ comprised of over 1,000 works representing a global history of art of 400 artists and 47 countries. Although the exhibition followed a historical, chronological perspective, it aimed to shed light on alternative movements and temporalities, with rooms focused on specific artist groups and countries such as a focus on Latin America and art movements such as ‘Anthropophagy‘, ‘Indigenism‘, and ‘Totemism’. In attempting to redress the collection to include previously uncollected or unexhibited artists, the exhibition also focused on a large number of works by women artists. Throughout the exhibition were ‘wallpapers’ of magazine covers and reviews from Art journals and artist manifestos of the time, including Ma, Zenit, Proa, Život, Black Orpheus, and Souffles. This ‘manifesto exhibition’ “illustrates the complex, dynamic relationships between modernity, identity, universality and vernacular culture running through the entire history of modern art. This contextual exhibition re-situates the masters of the avant-garde within networks of artistic exchange and emulation typical of this period… By confronting the canonical, linear viewpoint of movements with a history of marginal and peripheral approaches, it replaces a history of influences with a map of connections, transfers – and resistance movements too”.